Abstract. Protein kinase C (PKC) significantly contributes to the control of renal function, but little is known about the renal function or localization of PKC isoenzymes. Therefore, the localization of PKC isoenzymes α, βI, and βII was studied in rat kidney. Immunoblot analysis identified immunoreactive bands corresponding to PKC α, βI, and βII in total cell extracts of both renal cortex and medulla. 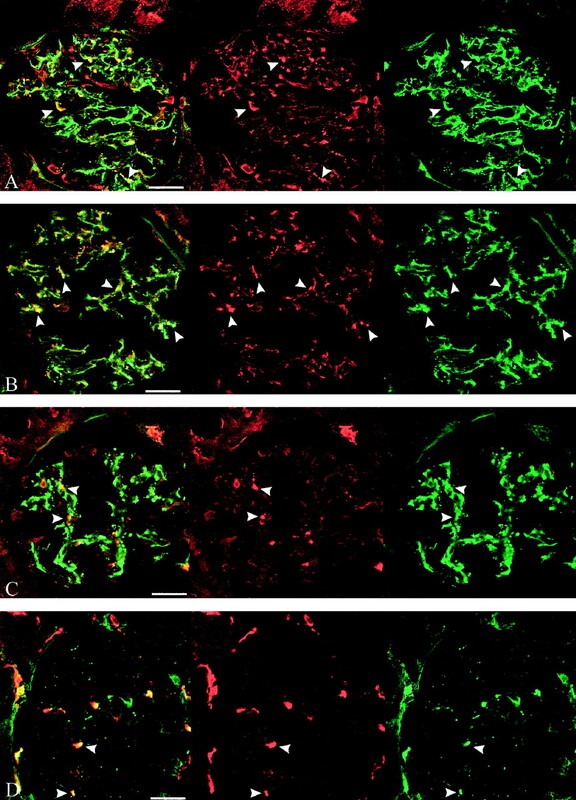 Immunohistochemistry using confocal laser scanning microscopy revealed immunostaining for PKC α within the glomerulus including podocytes and mesangial cells. PKC βI was detected in mesangial cells, whereas anti-PKC βII labeled neither podocytes nor mesangial cells. PKC βII, however, was detected in cells within the mesangial area, which expressed MHC II, a marker for antigen-presenting cells. None of the three isoforms was detected in glomerular endothelial cells. A prominent immunostaining with anti-PKC α and βI was localized to the brush border of S2 and S3 segments of proximal tubule, whereas S1 segments were not stained. Along the loop of Henle, both PKC α and PKC βI were found in the luminal membrane of cortical and medullary thick ascending limb. In addition, anti-PKC βI labeled the luminal membrane of thin limbs. In the cortical collecting duct (CCD), immunofluorescence for PKC α was observed at the apical membrane of both peanut agglutinin (PNA)-negative cells and part of PNA-positive cells, whereas in the medullary collecting duct (MCD), PKC α was detected at the basolateral membrane. In comparison, PKC βI was localized at the luminal membrane of PNA-positive cells only in CCD and at the luminal membrane of MCD. Unlike PKC α or βI, there was (1) no detectable immunostaining with anti-PKC βII in the proximal tubule, the loop of Henle, or the CCD and (2) a distinct staining for PKC βII of interstitial cells in cortex and medulla (including MHC II-positive dendritic cells). Furthermore, PKC βII was detected in the luminal membrane of MCD. In summary, a distinct and differential expression pattern for PKC α, βI, and βII was shown in rat kidney, which may contribute to a better understanding of the specific role of these isoenzymes in the control of renal function. Protein kinase C (PKC) represents a family of closely related enzymes that phosphorylate serine or threonine residues of various intracellular proteins and is thus involved in a wide range of cellular functions including ion transport, release of hormones or neurotransmitters, downregulation of receptors, and expression of various proteins (1). Based on their primary structure, the 12 isoenzymes of the mammalian PKC family identified thus far have been classified into three subfamilies. The first group, the classical or conventional PKC (cPKC), including the isoenzymes α, βI, βII, and γ, is dependent on activation through cofactors such as diacylglycerol (or, in vitro, phorbol esters) and Ca2+. The second group consists of novel PKC (nPKC), including δ, ϵ, η, [UNK] and μ. These isoenzymes are also activated by diacylglycerol but are Ca2+-independent. The third group, or atypical PKC (aPKC), including ξ, ι, and λ, requires only phosphatidylserine for activation (2,3,4). PKC has been proposed to play a central role in mammalian kidney function, where it appears to be involved in the control of renal hemodynamics and transport mechanisms. For example, angiotensin II and bradykinin were found to activate PKC in rat glomeruli (5). In the isolated rabbit proximal convoluted tubule, activation of PKC has been shown to inhibit transport of glucose, bicarbonate, and chloride (6). Other studies suggested that the inhibitory effect of dopamine on Na+, K+-ATPase activity in renal proximal tubule is mediated by PKC (7). Furthermore, parathyroid hormone has been found to activate PKC in opossum kidney (OK) cells (8). With regard to the collecting duct system, evidence suggests that bradykinin activates PKC in cortical collecting duct (CCD) cells (9). Furthermore, activation of PKC has been shown to inhibit the hydro-osmotic action of vasopressin in rabbit CCD (10). Breyer et al. (11) showed that inhibition of PKC blocks the inhibitory effect of prostaglandin E2 on vasopressin action in apical membranes of rabbit collecting duct (CD) cells. Finally, it has been shown that PKC activation in the medullary collecting duct (MCD) cells inhibits Na+, K+-ATPase activity, thus reducing sodium reabsorption (12). Besides these functional data, there is evidence that various PKC isoforms are expressed in the kidney. LaPorta and Comolli could detect the PKC isoenzymes α, β, δ, ϵ, and ξ in rat kidney cortex by Western blotting (13). Östlund et al. demonstrated the presence of PKC α, δ, and ξ in rat renal tissue by Northern and dot blot, Western blot, and in situ hybridization, but could not detect PKC β (14). More recently, Erdbrügger et al. provided evidence by PKC activity assay and Western blot that PKC α, δ, ϵ, ξ, λ, and ι are expressed in rat and human kidney (15). Although all of these findings point to a substantial role of PKC in renal function, little is known about which PKC isoenzymes are involved in the described actions. A first approach to better understand the role of PKC isoenzymes in the control of renal function would be to localize their expression along the nephron. Since PKC α as a member of the cPKC group appears to be the predominant isoenzyme in rat kidney (15,16), we intended to study its expression and its localization in rat kidney in more detail using Western blot analysis and immunohistochemistry, including confocal laser scanning microscopy. In addition, we examined the expression and localization of two other members of the cPKC group, i.e., PKC βI and βII. For the first time, we show a differential expression pattern for PKC α, βI, and βII in rat kidney. All animal experiments were conducted in accord with the National Institutes of Health Guide for the Care and Use of Laboratory Animals. Experiments were performed in female Munich-Wistar-Frömter rats (200 to 220 g body wt) bred in the animal facility of the Department of Pharmacology, University of Tübingen, Germany. Animals had free access to standard chow and tap water and were anesthetized by intraperitoneal injection of thiopental sodium (Trapanal®; Byk Gulden, Konstanz, Germany; 60 mg/kg body wt) on the day of the experiment. After anesthesia and opening of the abdominal cavity, kidneys were rapidly excised and dissected on ice in cortical and medullary parts. Pieces were immediately immersed into liquid nitrogen. Total cellular proteins were obtained by pulverizing the tissue and dissolving the powder in lysis buffer (20 mM Hepes, 150 mM NaCl, 10% glycerol, 1% Triton X-100, 4 mM ethyleneglycol-bis(β-aminoethylether)-N,N,N′,N′-tetra-acetic acid, 4 mM ethylenediaminetetra-acetic acid, 1mM phenylmethylsulfonyl fluoride, 30 μg/ml aprotinin, 5 μg/ml leupeptin, 10 μg/ml trypsin inhibitor, and 1 mM dithiothreitol). Homogenization was followed by centrifugation (17,000 × g, 15 min, 4°C). Protein content was determined as described by Bradford (17), using a commercial protein assay (Bio-Rad, Munich, Germany) and bovine serum albumin (Serva, Heidelberg, Germany) as a standard. Samples were diluted 1:4 with Roti®-Load sample buffer (Roth, Karlsruhe, Germany) and boiled for 2 min at 95°C. The following steps were performed at room temperature. Samples of 10 μg of protein (cortex) or 20 μg of protein (medulla), respectively, were subjected to sodium dodecyl sulfate-polyacrylamide gel electrophoresis using 8% acrylamide gels in a Mini-PROTEAN II Electrophoresis Cell (Bio-Rad). For determination of molecular weight, a 10-kD protein ladder (Life Technologies, Eggenstein, Germany) was used. After gel electrophoresis (60 mA/gel, 70 min), proteins were transferred to nitrocellulose paper of 0.45-μm pore size (Schleicher & Schuell, Dassel, Germany). Membranes were blocked for 90 min with phosphate-buffered saline (PBS) containing 2% gelatin, 2% normal goat serum, 2% low-fat milk powder, and 0.02% Tween 20 and rinsed twice with PBS containing 0.02% Tween 20 (PBST). Thereafter, the PKC antibodies (anti-PKC α at 0.3 μg/ml; anti-PKC βI and anti-PKC βII at 0.5 μg/ml) were incubated for 30 min in PBS containing 10 mM ethylenediaminetetra-acetic acid, 2% normal goat serum, and 0.2% gelatin. Blots were rinsed twice with PBST and washed twice for 15 min with PBST. The secondary horseradish peroxidase-conjugated antibody was incubated at a concentration of 0.1 μg/ml for 30 min in PBST containing 0.2% gelatin. Blots were rinsed twice with PBST and washed three times for 15 min with PBST. The immunoreactive bands were visualized by enhanced chemiluminescence system onto a Hyperfilm-ECL™ (Amersham, Buckinghamshire, United Kingdom). The specificity of the PKC antibody binding was confirmed by peptide neutralization of the antibodies with their corresponding peptide. For neutralization, antibodies were incubated with a 10-fold (by weight) excess of peptide antigen overnight at 4°C before incubating with the blotting membrane. After anesthesia, the left cardiac ventricle was exposed through subcostal incision of the abdominal cavity and subsequent opening of the pericardium. The tip of a perfusion system was placed into the left ventricle, and the arterial system was perfused for 1 min with PBS (120 mM NaCl, 16 mM Na2HPO4, 2,9 mM KH2PO4) to clear the kidneys of blood and subsequently for 10 min with 150 ml of a fixation solution (4% paraformaldehyde and 3% sucrose in phosphate buffer). Both solutions were at room temperature. Kidneys were removed, cut into slices (3 mm in thickness) displaying cortex and outer and inner medulla, and incubated for 1 h in the fixation solution at 4°C. After rinsing four times in PBS for 15 min, kidney slices were dehydrated in 30% sucrose in PBS for 12 h at 4°C. Thereafter, kidney slices were frozen in isopentane precooled by liquid nitrogen and stored at -80°C until further use. Cryosections of approximately 16 μm were made at -20°C and transferred onto gelatin-coated glass slides. The following steps were performed at room temperature. After preincubation for 45 min in PBS containing 4% normal goat serum, 1% bovine serum albumin, and 0.25% Triton X-100 in PBS, sections were incubated for 4 h with the respective anti-PKC antibody (anti-PKC α at a final concentration of 1.0 μg/ml; anti-PKC βI and anti-PKC βII at 2.0 μg/ml). For negative control, the primary PKC antibodies were preabsorbed with their corresponding peptides by incubating them with a 10-fold excess of peptide antigen in PBS for 2 h at room temperature before incubating the antibody-peptide solution with the sections. After washing the sections three times for 5 min with PBS, they were incubated for 1.5 h with Texas Red-conjugated goat anti-rabbit IgG (final concentration, 5 μg/ml). Sections were then washed twice for 10 min in PBS and mounted in FluorSave™ (Calbiochem, San Diego, CA) as fading retardant. Double staining experiments were performed with each one of the PKC antibodies and a primary antibody against the respective tissue epitope. To study the expression of PKC in glomerular mesangial cells, a monoclonal antibody (mAb) against Thy-1 antigen (final concentration, 2 μg/ml) was applied. For staining of glomerular endothelial cells, an mAb against von Willebrand factor (final concentration, 10 μg/ml) was used (18), whereas the thick ascending limb (TAL) was labeled by a polyclonal antibody (goat antiserum) against Tamm-Horsfall protein (19) (final concentration, 250 μg total protein ml). To further identify the anti-PKC βII-stained cortical interstitial cells, double labeling was performed with a mAb against ecto-5′-nucleotidase (1:100), which is expressed in cortical fibroblasts (20), or a mAb against OX6 (final concentration, 5 μg/ml), which is an MHC II gene product expressed on the surface of antigen-presenting cells (21) such as cortical and medullary interstitial dendritic cells (22). The following secondary antibodies were used: goat anti-rabbit IgG conjugated with carbocyanine (Cy2) for PKC antibodies (except for double staining with Tamm-Horsfall protein, see below); goat anti-mouse IgG conjugated with indodicarbocyanine (Cy5) for antibodies against Thy-1, von-Willebrand-factor, OX6, and ecto-5′-nucleotidase. For the antibody against Tamm-Horsfall protein, mouse anti-goat IgG conjugated with Cy2 was used. In this case, donkey anti-rabbit IgG conjugated with Cy5 was used as secondary antibody to the respective PKC antibodies. The final concentration of all secondary antibodies was 5 μg/ml. For labeling of filamentous actin in foot processes of podocytes or proximal tubular brush border, rhodamine-conjugated phalloidin (dilution 1:20) was used, whereas rhodamine-conjugated peanut agglutinin (PNA), which has been shown to stain a subpopulation of cells in CCD of the rabbit (including type B cells) (23), was used to label cells in the CCD (final concentration, 5 μg/ml). Sections were studied by confocal laser scanning microscopy (Zeiss LSM 410 Invert; Jena, Germany). For immunohistochemical reference, cryosections of rat brain were used, which showed specific immunostaining with all three PKC isoenzyme antibodies. For Western blot and immunohistochemistry analysis, polyclonal rabbit antibodies against the following epitopes were used: PKC α (human amino acid residues 651 to 672), PKC βI (human amino acid residues 656 to 671), PKC βII (human amino acid residues 657 to 673). These epitopes correspond to the last amino acids at the carboxy-terminal catalytic domain in the V5 region of the PKC. The antibodies and their corresponding peptides as well as anti-rabbit-IgG-horseradish peroxidase secondary antibody were purchased from Santa Cruz Biotechnology (Heidelberg, Germany). mAb against Thy-1 was purchased from Seikagaku Corp. (Tokyo, Japan), mAb against von Willebrand factor from Boehringer Mannheim (Mannheim, Germany), and goat antiserum against Tamm-Horsfall protein from ICN (Eschwege, Germany). mAb against MHC class II (OX6) was purchased from Harlan Sera-Lab Ltd. (Loughborough, United Kingdom). mAb against ecto-5′-nucleotidase was a generous gift from B. Kaissling (Anatomisches Institut der Universität, Zürich, Switzerland). Rhodamine-conjugated phalloidin was obtained from Molecular Probes (MoBiTec, Göttingen, Germany), and rhodamine-conjugated PNA was from Vector Laboratories (Burlingame, CA). Texas Red- and Cy2-conjugated goat anti-rabbit IgG as well as Cy5-conjugated goat anti-mouse IgG, Cy5-conjugated mouse anti-goat IgG, and Cy5-conjugated donkey anti-rabbit IgG were obtained from Dianova (Hamburg, Germany). In both cortex and medulla, PKC α and PKC βI stained primarily at approximately 80 kD, whereas PKC βII was detected at approximately 83 kD (Figure 1). These molecular weights are in agreement with the literature (24,25,26,27). The smaller proteins detected by antibodies against PKC α and βI were inhibited by antibody preabsorption with the respective peptide and could represent proteolytic fragments due to enzymatic degradation. 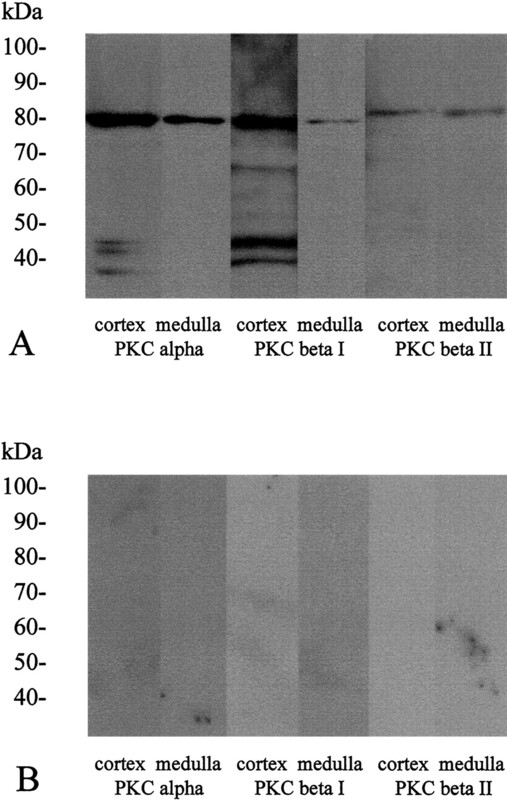 (A) Western blot analysis showing the expression of protein kinase C (PKC) α, βI, and βII in rat renal cortex and medulla at approximately 80 kD. (B) Antibody preabsorption with the respective peptide inhibited all bands on the Western blots completely. The distribution of PKC isoenzymes α, βI, and βII in rat kidney is depicted in Table 1 and illustrated in Figures 2 3,4,5,6,7,8. The specificity of all three PKC isoenzyme polyclonal antibodies was tested by preimmunoadsorption with the corresponding peptides. This treatment consistently abolished specific binding of the fluorescence secondary antibody. Immunolocalization of PKC α, βI, and βII in rat glomerular podocytes. Double staining with antibodies against PKC α, PKC βI, and PKC βII, respectively (red fluorescence), and rhodamine-conjugated phalloidin, which labels filamentous actin in foot processes of podocytes and proximal tubular brush border (green fluorescence). Scale bars, 25 μm. (A) PKC α. Bodies of podocytes were stained (arrowheads). (B) PKC βI. In podocytes, a faint signal for PKC βI may be present. A clear-cut positive labeling, however, could not be assigned unequivocally (arrowhead). (C) PKC βII. No significant signal was detected in podocytes after labeling with PKC βII antibodies. Immunolocalization of PKC α, βI, and βII in rat glomerular mesangial cells. Double staining with antibodies against PKC α, PKC βI, and PKC βII, respectively (red fluorescence), and anti-Thy-1, which labels mesangial cells (green fluorescence) (A through C). Scale bars, 25 μm. 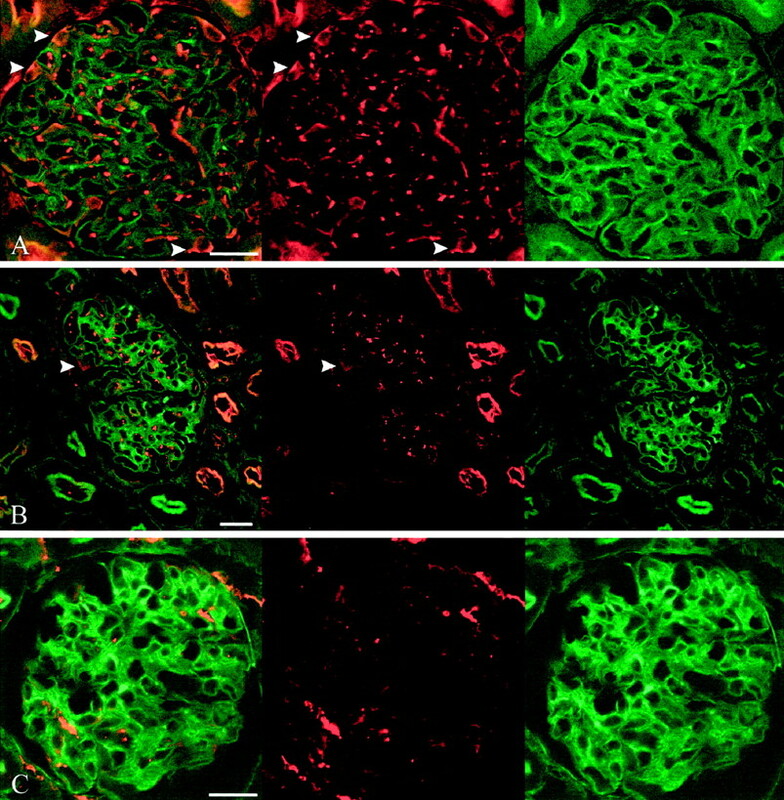 PKC α (A) and PKC βI (B) were detected in glomerular mesangial cells (arrowheads). (C) PKC βII labeled round, cell-like structures within the mesangial area, which morphologically appeared not to represent mesangial cells (arrowheads). (D) Colocalization of PKC βII (red fluorescence) and anti-OX6 (green fluorescence), a marker for MHC II-positive, antigen-presenting cells (arrowheads). There was no staining of OX6-positive cells by anti-PKC α or anti-PKC βI (not shown). Immunolocalization of PKC α and βI in rat proximal tubule. Double staining with antibodies against PKC α and PKC βI, respectively (red fluorescence), and rhodamine-conjugated phalloidin (green fluorescence), which stains the brush border of proximal tubule. Scale bars, 25 μm. PKC α (A) and PKC βI (B) in cortical labyrinth. 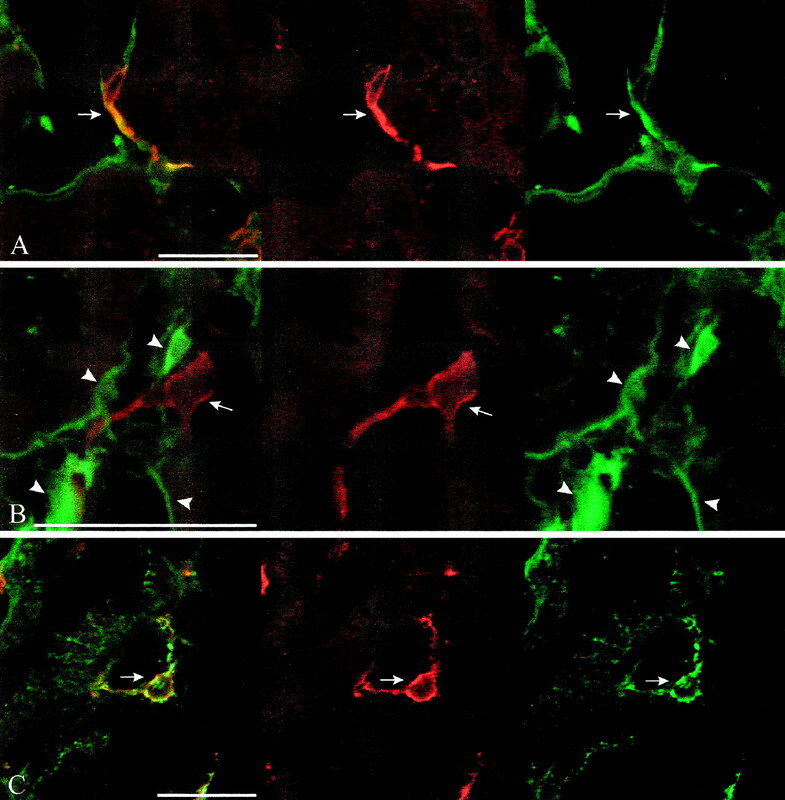 Proximal tubules showed no immunofluorescence in the S1 segments (which were defined by a dense and high brush border and close localization to glomeruli [arrows] or direct connection with the parietal epithelium of the urinary pole of the glomerulus), but a very prominent staining of the brush border of S2 segments (which were defined by a less dense brush border that was reduced in height) with anti-PKC α or anti-PKC βI antibodies (arrowheads). PKC α (C) and PKC βI (D) in medullary rays of the outer stripe of outer medulla. Both PKC α and PKC βI were detected in the brush border of S3 segments (arrowheads). Immunolocalization of PKC α and βI in thin limbs and thick ascending limbs (TAL). Double staining with antibodies against PKC α and PKC βI (red fluorescence), and anti-Tamm-Horsfall protein (green fluorescence), which labels the luminal membrane of TAL. Scale bars, 25 μm. (A) PKC α in cortex. Luminal membrane of cortical TAL showed a positive signal for PKC α (arrowheads). (B) PKC α in inner stripe of outer medulla. PKC α was detected in luminal membrane of medullary TAL (arrowheads). (C) PKC βI in cortex. Like PKC α, PKC βI could be detected in luminal membrane of cortical TAL (arrowheads). (D) PKC βI in inner stripe of outer medulla. Luminal membrane of medullary TAL was immunopositive for PKC βI (arrowheads). Immunolocalization of PKC α and βI in cortical collecting duct (CCD). Double staining with antibodies against PKC α and PKC βI, respectively (red fluorescence), and rhodamine-conjugated peanut agglutinin (PNA; green fluorescence), which has been shown to stain a subpopulation of cells in CCD of the rabbit (including type B cells) (23). As shown, the appearance of the staining with PNA in rat CCD resembles the staining in rabbit CCD as indicated by predominant labeling of a subpopulation of cells that exhibit an intercalated cell-like appearance. Scale bars, 25 μm. (A) PKC α. In CCD, PKC α was expressed in the luminal membrane of both PNA-negative cells (arrowheads) and part of PNA-positive cells (asterisk). A part of PNA-positive cells, however, was PKC α-immunonegative (arrows). (B) PKC βI. Immunofluorescence for PKC βI was detected in the luminal membrane of PNA-positive cells (arrows). Immunolocalization of PKC α, PKC βI, and PKC βII in medullary collecting duct (MCD) (inner medulla). Scale bars, 25 μm. (A) PKC α. The basolateral membrane of MCD was intensely stained (arrows). (B) PKC α. Only MCD were immunopositive (arrows), whereas thin limbs were not stained. (C) PKC βI. Staining of the luminal membranes of both MCD (arrows) and thin limbs (arrowhead). (D) PKC βII. Anti-PKC βII stained predominantly the basolateral membrane of MCD (arrows). In addition, medullary interstitial cells were labeled (asterisk). Further identification of cortical interstitial cells expressing PKC βII. Double staining with antibodies against PKC βII (red fluorescence) and ecto-5′-nucleotidase (green fluorescence), which is a marker for fibroblasts (A and B), or OX6 (green fluorescence), which labels MHC II-positive, antigen-presenting cells (C), respectively. Scale bars, 25 μm. (A) One of few anti-ecto-5′-nucleotidase-positive fibroblasts that were also labeled by anti-PKC βII (arrow). (B) PKC βII in a dendritic-shaped cell (red; arrow) surrounded by PKC βII-negative but anti-ecto-5′-nucleotidase-positive fibroblasts (green; arrowheads). (C) PKC βII in an OX6-positive, dendritic-shaped cell (arrow). Within glomeruli, immunostaining for PKC α included the bodies but not the foot processes of podocytes as well as mesangial cells (Figures 2A and 3A). PKC α could not be detected in glomerular endothelial cells as studied by double labeling with antibodies against von Willebrand factor (not shown). In the cortical labyrinth, there was no signal detected in S1 segments of proximal tubules after staining with anti PKC α (Figure 4A). In contrast, a very bright immunofluorescence was localized to the brush border of S2 segments. 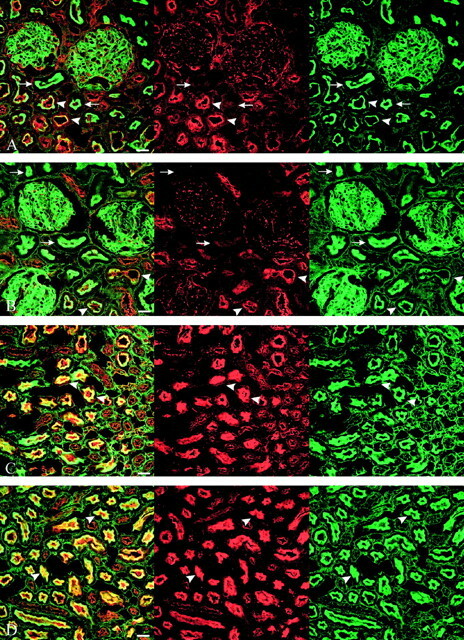 S1 segments were identified by a dense and high brush border and close localization to glomeruli or direct connection with the parietal epithelium of the urinary pole of the glomerulus. In comparison, S2 segments were defined by a less dense brush border that is reduced in height (28). Immunostaining of proximal tubules was very bright within the brush border of S3 segments in the outer stripe of outer medulla (Figure 4C). 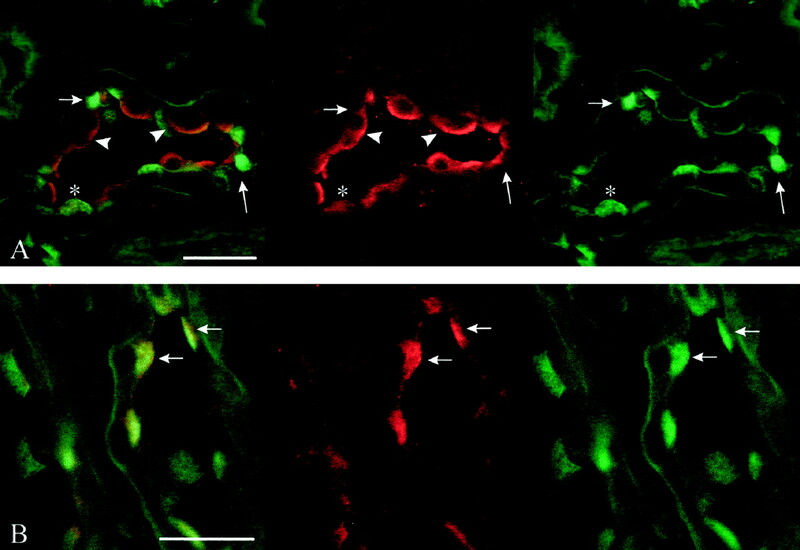 No visible immunofluorescence was detected in thin limbs of Henle's loop, whereas the luminal membranes of cortical and medullary TAL were labeled (Figure 5, A and B). To characterize the expression of PKC α in CCD, PNA was used, which has been shown to stain a subpopulation of cells in CCD of the rabbit (including type B cells) (23). It was observed in the present study that the appearance of the staining with PNA in rat CCD resembles the staining in rabbit CCD as indicated by predominant labeling of a subpopulation of cells that exhibit an intercalated cell-like appearance (Figure 6, A and B). Because the subtype of cells in rat CCD stained by PNA has not yet been established, however, cells of the CCD that are stained by PNA in the present study are referred to as PNA-positive cells. It was found that anti-PKC α stained the luminal membrane of both PNA-negative cells and part of PNA-positive cells in CCD (Figure 6A). In MCD, a bright labeling of the basolateral membranes was observed (Figure 7A). Anti-PKC βI stained mesangial cells (Figure 3B). In podocytes, a faint signal for PKC βI may have been present. A clear-cut positive labeling, however, could not be assigned unequivocally (Figure 2B). Anti-PKC βI did not label endothelial cells (not shown). 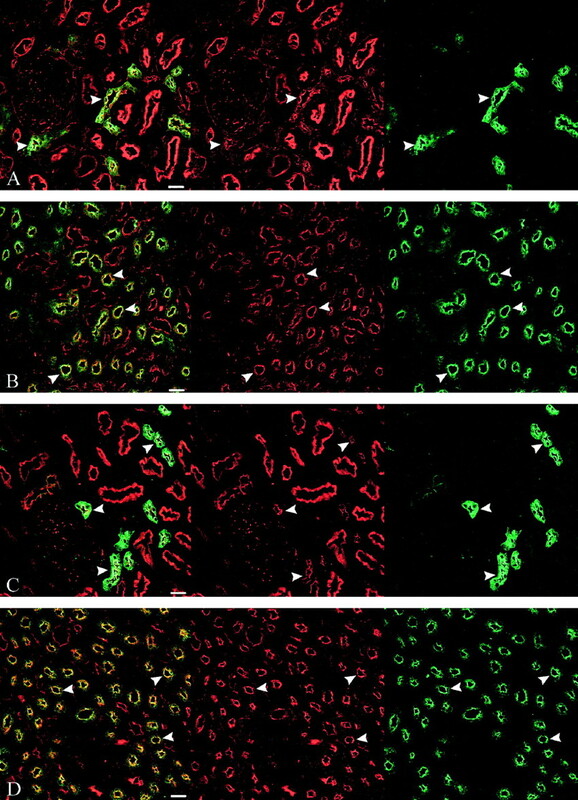 As shwon for PKC α, PKC βI immunofluorescence was observed in the S2 and S3 segments of proximal tubular brush border (Figure 4, B and D), whereas no significant signal was detected in S1 segments (Figure 4B). Unlike anti-PKC α, anti-PKC βI labeled the luminal membrane of thin limbs of Henle's loop (Figure 7C). As shown for PKC α, PKC βI was detected at the luminal membrane of cortical and medullary TAL (Figure 5, C and D). 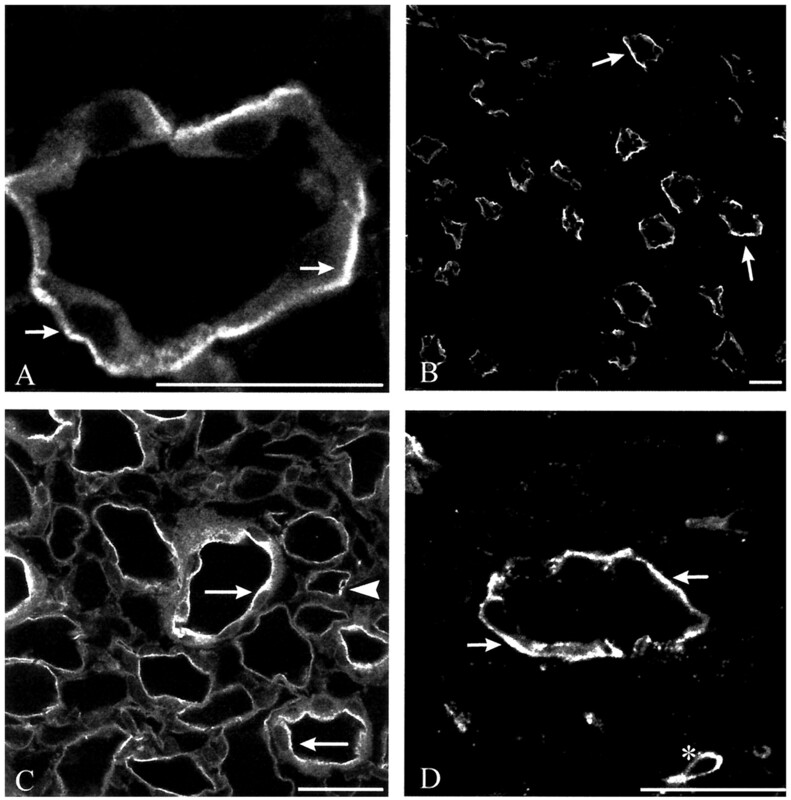 Compared with anti-PKC α, anti-PKC βI stained predominantly the luminal membrane of PNA-positive cells in CCD (Figure 6B) and the luminal membrane in MCD (Figure 7C). In contrast to PKC α and PKC βI, PKC βII could not be detected in glomerular mesangial cells (Figure 3C). In some glomeruli, however, anti-PKC βII stained round cell-like structures that appeared to be localized within the mesangial area and that were double-stained by an antibody against OX6, which is a marker for MHC II-positive, antigen-presenting cells (21) (Figure 3D). Podocytes (Figure 2C) and glomerular endothelial cells (not shown) appeared PKC βII-immunonegative. Furthermore, there was no detectable staining with anti-PKC βII in proximal tubules, TAL, or CCD (not shown). In MCD, anti-PKC βII labeled predominantly the basolateral membrane (Figure 7D). In contrast to PKC α or βI, anti-PKC βII stained both cortical and medullary interstitial cells. A significant portion of both cortical and medullary PKC βII-positive interstitial cells was colabeled by anti-OX6 antibodies (Figure 8C). In comparison, anti-PKC βII-labeled cortical interstitial cells included only a very minor fraction of ecto-5′-nucleotidase-positive fibroblasts (Figure 8, A and B). Renal function is controlled by a wide spectrum of hormonal and neuronal inputs, many of which appear to involve activation of PKC in distinct nephron sites. Since it became evident that PKC represents a family of at least 12 different isoenzymes, however, localization of the isoenzymes in the kidney appears crucial to better understand the role of PKC in the control of nephron function. In the present study, we report a differential expression pattern of the three PKC isoenzymes α, βI, and βII in rat renal tissue. Using Western blotting techniques, PKC α, βI, and βII were detectable in total cell extracts of both rat renal cortex and medulla. The bands of the PKC isoenzymes α and βI showed molecular weights of approximately 80 kD, which agrees with the findings of other groups (24,25). We detected PKC βII in rat renal cortex and medulla at a molecular weight of approximately 83 kD. A molecular weight of 85 kD has been reported for PKC βII in different cell types (26,27). Of the three isoenzymes investigated, PKC α was the predominating isoform in the rat kidney. Furthermore, the abundance of PKC α per mg protein was higher in renal cortex than in medulla. In comparison, Östlund et al. have demonstrated the presence of PKC α in rat renal tissue by Northern blot, Western blot, and in situ hybridization, but could not detect PKC βI or PKC βII in rat kidney (14). In contrast and similar to our findings, using Western blotting techniques, Kosaka et al. found PKC βI and II in total kidney cell extracts (29) and LaPorta and Comolli could show PKC β in rat kidney cortex (13). Evidence suggests that hormones such as angiotensin II or bradykinin can activate PKC in rat glomeruli (5); however, which PKC isoenzymes are activated is not known. The present immunohistochemical experiments revealed a significant immunostaining of glomerular mesangial cells for PKC α and PKC βI. Furthermore, PKC α was detected in podocytes. Comparing the staining by PKC α and phalloidin, which labels filamentous actin in the foot processes of podocytes, it appeared that PKC α was localized to the bodies but not to the foot processes of podocytes. The signal-to-background ratio, however, did not allow us to unequivocally assign a significant signal for PKC βI to podocytes. In contrast to PKC α or PKC βI, there was no labeling of mesangial cells or podocytes for PKC βII. In some glomeruli, however, PKC βII was detected in cells within the mesangial area that expressed MHC II, suggesting that these cells are antigen-presenting cells (21). None of the three isoforms was detectable in glomerular endothelial cells. Several studies demonstrated that PKC plays an important role in proximal tubular reabsorption (6,7). Applying confocal laser scanning microscopy, the immunohistochemical studies showed that PKC α as well as PKC βI are highly expressed in the brush border of S2 and S3 segments of the proximal tubule. In comparison, no significant signal for these two isoforms was observed in the S1 segment. In contrast to PKC α or PKC βI, PKC βII was not detected in proximal tubules. Compared with our study, Karim et al. could detect PKC α but not PKC β in isolated rat proximal tubules (30). Dong et al. showed by immunohistochemical methods that PKC α is highly expressed in rat proximal tubules (16). Those studies, however, could not give any information about the subcellular localization of PKC α. The present findings suggest that in contrast to PKC βII, PKC α and PKC βI are involved in the control of reabsorption or secretion mechanisms across the luminal membrane in S2 and S3 segments of proximal tubule. With regard to the loop of Henle, the present immunohistochemical experiments indicated that both PKC α and PKC βI are expressed at the luminal membrane of medullary and cortical TAL. PKC α, in addition, was localized to the luminal membrane of thin limbs, whereas PKC βII could not be detected along the loop of Henle. The functional role of PKC α and PKC βI in the loop of Henle remains to be determined. PKC has been shown to mediate the inhibitory influence of various hormones on water channels and sodium transport in the CCD (10,31,32). In the present study, PKC α and PKC βI were detected in CCD as well as in MCD. Their cellular and subcellular distribution in those nephron segments, however, seemed to differ. In CCD, PKC α was expressed in the luminal membrane of cells that were PNA-negative and that exhibited a principal cell-like appearance. In addition, PNA-positive cells that had the appearance of intercalated cells were in part stained by anti-PKC α. In comparison, PKC βI appeared to be present in the luminal membrane of PNA-positive cells only. In MCD, PKC α was localized in the basolateral membrane, whereas PKC βI was detected in the luminal membrane. Although these results point to a potential role of these two PKC isoenzymes in water and sodium transport in these nephron segments, the differential localization of PKC α and PKC βI along the CD proposes that these isoenzymes could affect epithelial transport through different mechanisms. Compared with PKC α and PKC βI, PKC βII could be detected in the basolateral membrane of MCD but appeared to be absent in CCD. Unlike PKC α or PKC βI, PKC βII was detected in both cortical and medullary interstitial cells. In rat renal cortex and medulla, dendritic cells and fibroblasts are the two predominant cell types (33). Dendritic cells are defined by morphologic criteria, such as long cellular processes, as well as a high expression of MHC II, which is typically found on antigen-presenting cells. The latter can be identified by using antibodies against the MHC II gene product OX6 (33). Applying these criteria, PKC βII was expressed in both cortical and medullary dendritic cells. In comparison, ecto-5′-nucleotidase is a specific marker for cortical fibroblasts (21). Double staining experiments with ecto-5′-nucleotidase and PKC βII antibodies resulted in a number of PKC βII-positive cell bodies that appeared to have ecto-5′-nucleotidase-positive but PKC βII-negative processes. Because fibroblasts and dendritic cells occur in a strikingly narrow spatial association (22), these PKC βII-positive cell bodies most likely belonged to dendritic cells and were surrounded by fibroblast processes. On the other hand, in a few anti-ecto-5′-nucleotidase-positive fibroblasts, both cell body and cell processes were double-stained by anti-PKC βII antibodies. Because at present there is no unequivocal marker for medullary interstitial fibroblasts available (anti-ecto-5′-nucleotidase only labels cortical fibroblasts), no further approach to identify PKC βII-positive medullary interstitial cells could be performed. The present data indicate that a substantial part of cortical and medullary interstitial cells expressing PKC βII are dendritic, antigen-presenting cells. The role of PKC βII in these cells remains to be determined. Because there is evidence that both PKC β and renal interstitial cells are involved in kidney growth and regeneration processes (25,34), a role for PKC βII in renal interstitial cells in kidney growth could be speculated. The latter would be in accordance with preliminary findings showing that the expression of PKC βII in renal interstitial cells is significantly increased during pronounced kidney growth as observed in early experimental diabetes mellitus (I. L. Pfaff and V. Vallon, unpublished observation). The present study shows a distinct and differential expression pattern for PKC isoenzymes α, βI, and βII in rat kidney, which may contribute to a better understanding of the specific role of these isoenzymes in the control of renal function. This work was supported by grants from the Deutsche Forschungsgemeinschaft (DFG Va 118/3-1 and 3-2), the fortüne program of the University of Tübingen (No. 427), and the Federal Ministry of Education and Research (Bundesministerium für Bildung, Wissenschaft, Forschung, und Technologie 01 EC 9405 and 01 KS 9602). The authors acknowledge the support and helpful discussion of Drs. E. Schleicher, U. D. Behrens, R. Kröger, and A. Mack. This work was presented in part at the 29th Annual Meeting of the Gesellschaft für Nephrologie, Erlangen, Germany, 1998, and has been published in abstract form (Kidney Blood Press Res 21: 132, 1998).